to properly lace a corset. Use but one pair of laces — long ones . . .
After lacing them in the corset, fasten each end of them so they cannot pull through the eyelets, and arrange them so that the surplus length comes just at the waist line. it is put on . . .
and it should also be unlaced before it is taken off, in order to save the extra strain on the cloth. Wear is caused much more by extra strains than by use — if properly chosen and worn there is no strain on any part of it. As the corset must be unlaced before its next wearing, it takes no more time to unlace it before it is taken off. The sides of a corset . . .
should be six or eight inches apart when it is put on. Place it about the body . . .
as low down as it is comfortable, and hook the lowest hook. Take a long breath . . .
and settle the corset still lower, until it is under the body. Perhaps you may have to slip the hand down inside it at the back and sides as well. Then fasten the front elastics . . .
and begin to lace it with a sharp pull at the strings to anchor it at the waist line. Always pull the strings downward in lacing. 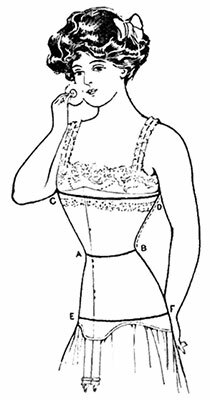 When exactly right, a corset should have its sides two inches apart at the waist, and three at the thickest part of the figure. Do not wind the surplus strings . 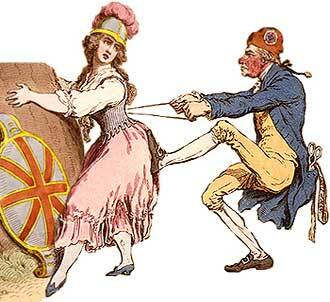 . .
about the waist and tie them, for that wears out the material and helps to break the garment at the waist. Tie them in the back of the corset, and twist them loosely. Then poke them inside the lacing next to the body, not in a bunch, but in a line lengthwise of the corset. 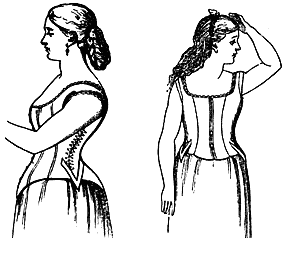 The Boston Comfort Corset had a socket adjustment for the shoulders, contrived and fitted so it could not slip up on the neck or down on the arm. It also had a balance strap for sustaining the stockings. By these inventions, the whole burden of the clothes was transferred to that part of the shoulder best adapted to sustain their weight; supporting everything without the least inconvenience and almost without the wearer's consciousness. Thus, the name of this corset was the Comfort Corset. In the place of bones, there were inserted continuous rows of very stiff cord which gave all the support of bones with the advantage of yielding every movement of the form, and of being washed without changing the fitness of the garment. Stylish as the Lord and Taylor corsets in the 1881 catalog, yet it combined ease and comfort with elegance and shape. For children, the advent of this corset marked a new era in children's waists. It was claimed that no movement of the arms could displace the shoulder-socket. Stockings and skirts were always in position, and all was ease and comfort. Walking or running, sitting down or jumping rope, it was all the same. The lady’s corset was laced, while the child's corset buttoned in the back. Each corset was stamped with two numbers signifying the two measurements — the first being the size in inches around the waist and the second around the shoulders. There were several variations so that any lady or child could be easily fitted. For the waist measure, draw the tape tight around the waist over the dress, and deduct two inches for thickness of clothes. 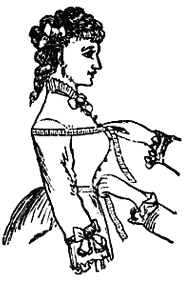 For the shoulder measure, also taken over the dress, pass the tape around the shoulders (as shown in the illustration), draw moderately, not tight, and make no deduction.